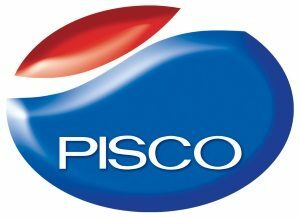 Pisco offers a wide variety of pneumatic equipment, such as tube fittings, controllers, switching devices, vacuum devices and piping tubes. The impressive line-up of these products all feature the well-reputed originality of Nihon Pisco. In addition to standard models, a wide array of custom-made products are available to satisfy your most specific applications. Easy connection/disconnection of tube made by a quick hold/release mechanism. Quick-fittings come in a variety of types, models and sizes to satisfy various piping demands. 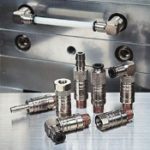 Designable fitting manifolds, rotary fittings, rotary blocks or fittings without quick-fitting mechanism. Fittings suitable for controlling temperature of die for pastic injection molding. These light weight couplings are also incorporated with the quick-fittings mechanism. These controllers equipped with quick-fittings can regulate air flow to control the operational speed of pneumatic actuators. Small sized pressure regulators are also equipped with quick-fittings and some are come with a miniature pressure gauge. Regular size filters, filter-regulators are also available. Unique membrane type air dryers and modular dryers, which do not require electricity to operate, keep maintenance costs low. Miniature sized (9/16″ diameter) pressure gauges equipped with quick-fitting have an accuracy of +/- 5% of full span. Taper-threaded 40mm diameter gauge also available. Light-weight, resin molded silencers for port size up to 1/2″ female pipe thread. 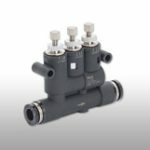 Different types of manually operated 2- or 3- way valves equipped with quick-fitting or male thread. Manifold type or individual type solenoid valves are offered in different styles. Air operated miniature or regular size hand and rotary actuators. Plastic tubings in variety of materials.